people always like to eat kinds of snack food when going to a mall for shopping, eat while walking already is a kind trend, so many businessmen choose to sell snack, fast food in a shopping mall ; crepe and ice cream is very hot sale and popular in foreign, especial in America and France, people are extreme like crepe and ice cream, what’s more, this 2 kinds food match, can make kinds of delicious food. 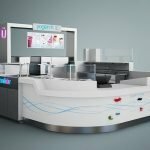 indeed, it has an attractive shape and unique display ways, you can clearly see the kiosk divide into 3 areas, front sell area and left food prepared area and behind big equipment and sink area . this is a very reasonable and high standard requirement for America mall and department of health. 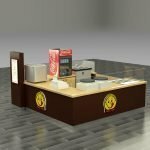 let’s us first see front sell area, the front wall of kiosk we make some pattern sculpture with customer logo, this kind pattern sculpture let whole kiosk more delicate, cash counter area , we make a glass boxes with led light strips and inside can put some ice cream model, when night turn off light, this area is very attractive and nice . maybe you are curious with round cup shape, it has functional effect: take-out package stand. 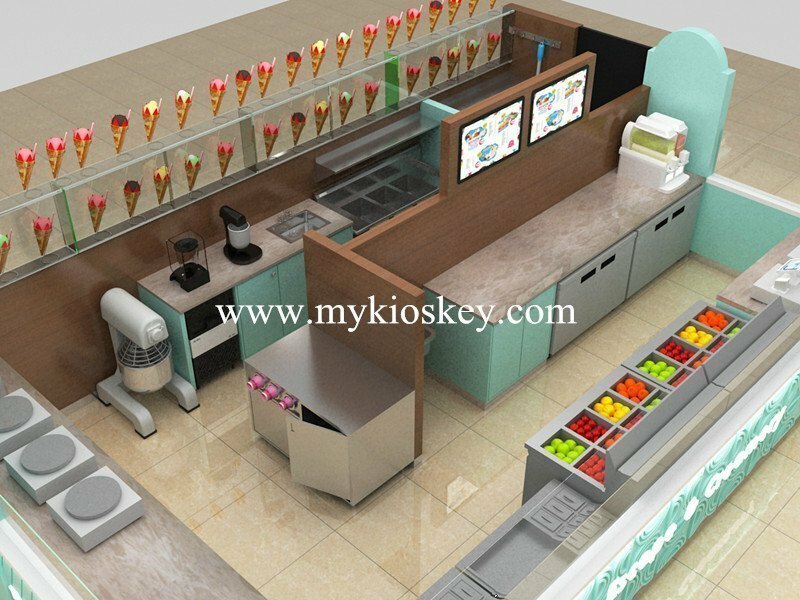 about the top glass, if you take a good look at it, you will find top is bend glass, when staff finish ice cream and they can directly put on top of glass and then let customer take away , I think our designer consider very humanization in this way , back wall part, we put 2 TV for play videos and menu, right side wall we also add colorful round pot ,this is luminous acrylic decoration. 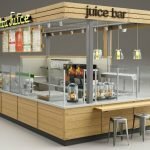 next, let’s us see left side food preparation area, the counter is for crepe maker, outside wall same, we also make slant wood strips decoration, very match pattern sculpture, there is one pillar to coordinate right pillars and let whole kiosk more harmony. 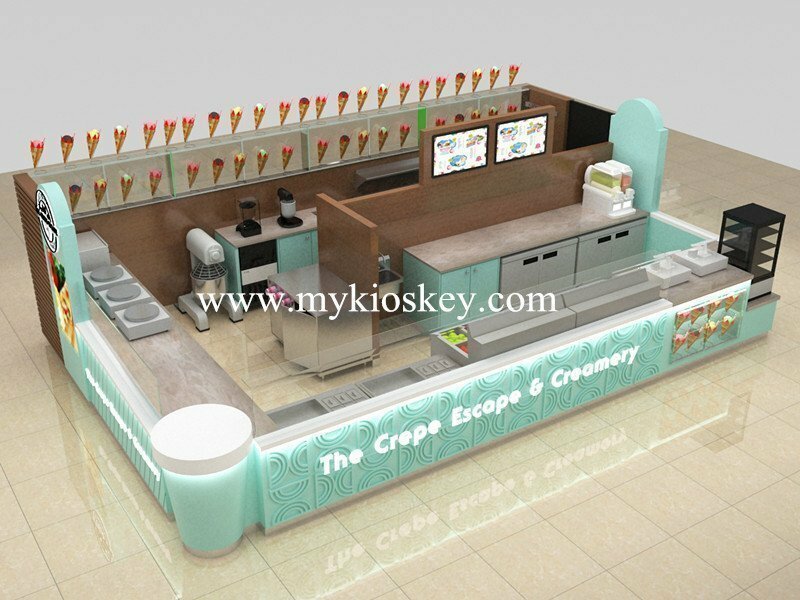 of course very obvious and attractive part, that is top ice cream model display, the designer makes 2 layer glass shelves to put these lovely ice cream model, I believe many people will is attracted even if standing far away. do you like our this crepe ice cream kiosk? welcome inquiry.